In JungleBell we made it as easy as possible for you to monitor and edit the alerts you have created earlier. In this way you always have a clear overview of all your alerts in one place. 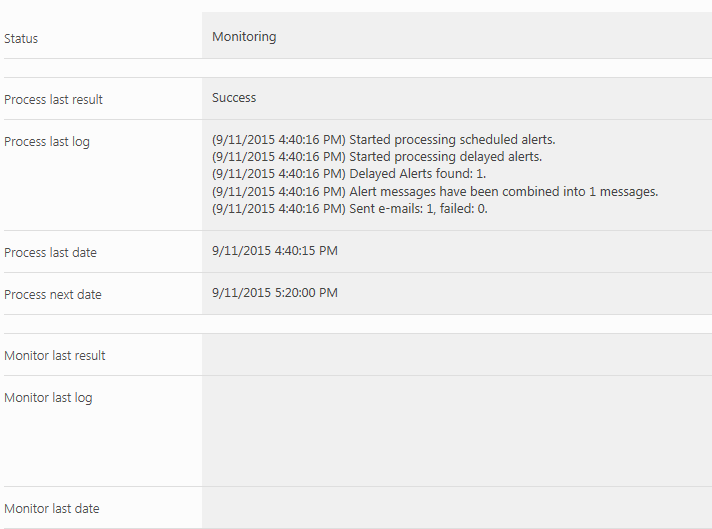 In this tutorial you will learn how to monitor and edit your existing alerts. All of your JungleBell alerts are stored in one easily accessible location. You will find your JungleBell Alerts list on the top-level site in the current site collection. Let's get started. Navigate to the JungleBell Alerts list located on the top-level site in the current site collection. Click the alert title link to view an alert. Click the Log link to view alert processing log and see errors if such exist. You will also have to edit your existing alerts sometimes. Let's review how to do this. 2. You will find all available alerts here. You can click the alert title to see the status and log of any alert. To edit or delete the alert you must click corresponding buttons on the left of alert row. 3. If you click Edit you will be taken to the same dialog that is also used to create new alerts. You can change the alert trigger, conditions, content, recipients and scheduling. Please refer to our Alert Trigger Event and Conditions guide for more information on alert triggers and conditions.